This is the last week of Asthma Awareness Month. We wanted to talk more about dust mites and allergies. Dust mites are one the most common allergen around. 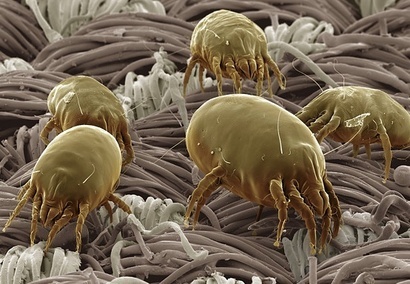 It can take 1 month for new homes and new furniture to become polluted with dust mites. If there is a high percentage of humidity in a home, dust mites can live up to 80 days and they thrive in humid, hot conditions. According to the EPA, exposure to dust mites can cause asthma in children who have not previously exhibited asthma symptoms. Wash your sheets and pillows in hot water. *Below is a video provided by How Stuff Works and you can learn about allergy test and dust mites. Team Heat at Alliance Environmental Group,Inc specializes in killing dust mites by applying the appropriate amount of heat. Heat treatment is an effective, safe, and environmentally friendly alternative that can be used for entire structures and confined areas. If you have any questions on the services we provide to reduce dust mites we can be of assistance.